Powers Electrical Solutions wants to earn your business with our professional approach to electrical contracting. Let our insured, licensed electricians provide you with electrical solutions for your unique home or business. We offer electrical solutions in Smyrna, Mableton, Powder Springs, Marietta and the greater Atlanta area. We value honesty, integrity, respect, and trust. If you are looking for a Smyrna area electrician that you can trust, give us a call for superior electrical service. We can help save you money and hassle by upgrading your electrical components. Our licensed electricians repair everything from electrical panels, generators, wiring and more. After listening to the customer and assessing possiblities, we design and implement the right lighting solution. Many homes and businesses have inefficient lighting. We offer high-efficiency LED Retrofit lighting to help our customers save money. Safety is one of the most important things in our lives. Knowing that your Smyrna area home is electrically safe and sound is important. Anytime that you place a service call with Powers Electric we will give you a free safety check up. Sometimes the most horrible accidents can easily be prevented before hand. With all of the new technology on the market, managing your home systems can easily get out of hand. From energy usage to security we can come in and set up a smart home system that you can safely use from your phone even while you’re away from your Smyrna area home. The options are limitless. Give us a call today to find out what is possible. Here at Powers Electric we take pride in making sure that all of our team members are well trained in electrical device installation. We care about the things you do and they are important to us. We make sure that all of your needs are taken care of. All of our work is done to NEiS standards so you will not have to worry about an unprofessional job. Outdoor Lighting is a great way to bring your yard to life at night. Your outdoor spaces will be used more often in the evening. Not only will it make your Smyrna area home and yard more beautiful it will help decrease your chance of a break in. Prowlers are less likely to try and break into a house with a well lit yard. We have used Powers Electrical Solutions for everything from rewiring our home to hiding wires for flat screen TVs. We have been happy with all the work we’ve had done. We feel Powers Electrical Solutions is an outstanding company with fair and honest bids. Their customer service is exceptional as well. Read More HereReview by Mimi C.
I highly recommend Powers Electrical for any of your electrical needs. They sincerely take pride in what they do, which is why they have a lifetime warranty on labor! No problem or job, is too big or too small, for them to handle. You will be completely satisfied and they won’t stop until you are! They are my ONLY go-to source for all my electrical needs.Review by Dee A. Great, reliable service at amazing prices! Thanks for your good quality work! I had them install a new ceiling fan and light (new installation). They also mounted my TV, installed an electrical plug behind the TV and ran the TV wires through my wall. I highly recommend these guys!Review by Thomas F.
Professional, knowledgeable, prompt, and great service. If you’re like me, you want the best and hate finding new service providers. I had asked my neighbors if they had a good electrician on hand. Unfortunately, they did not. So it was off to the internets. I looked on Angie’s List for an electrician and found one which did not work out. Then I found Powers Electrical. Read More HereReview by Farhan S.
We discovered that our builder put all of our outside, garage and several basement outlets on one breaker when our Christmas lights kept popping it. I found Powers electrical solutions yesterday on yelp- I called and left a message thinking I guess it will be next week before I can get this fixed… Guess again! The owner called me back within 5 minutes. Read More HereReview by Amy H.
We’ve used Powers Electrical Solutions many times and each time they have done excellent work! Super responsive and very knowledgeable! Paul, the owner is also a really nice guy, which is always an added bonus. I would highly recommend them to anyone!Review by Kelly H.
As a small business owner, I understand what it means for my clients to go above and beyond for a customer. Powers Electrical do just that. 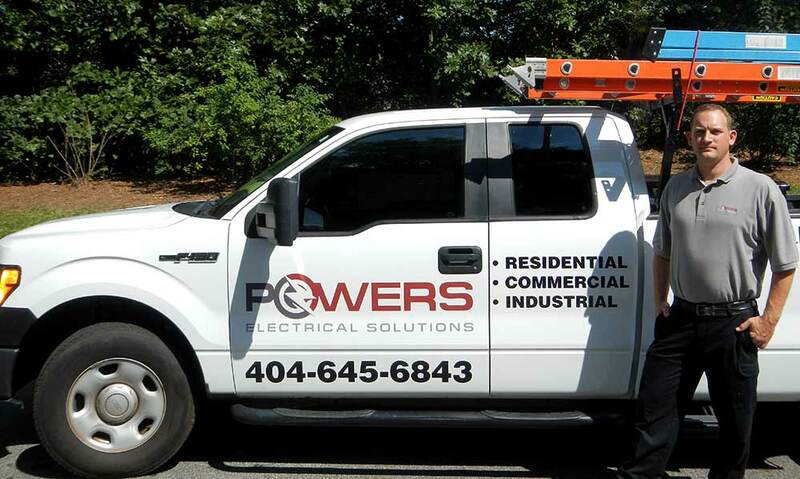 All the guys at Powers Electrical Solutions are punctual, professional, and experts in their craft. The Atlanta region is lucky to have them around. If you need a trustworthy electrician, look no further.Review by Aaron S.
We serve customers throughout metro Atlanta. Our service area includes but is not limited to Smyrna, Mableton, Powder Springs and Marietta, Georgia.